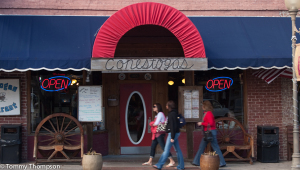 Rick Robertson and his crew at Conestoga’s Restaurant in downtown Alachua, Florida have just one thing on their minds: letting you leave after some pretty good eating and with a full belly! 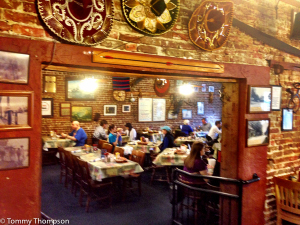 Enjoy your meal in the eclectic dining rooms at Conestoga’s. Open for lunch and dinner, Monday thru Saturday, Conestoga’s is located at 14920 Main Street in Alachua (Phone (352) 462-1294), just a few miles up US441 from Gainesville and the University of Florida. Widely know for the quality of its steaks and other beef dishes, you’ll also find seafood, pork and poultry on the menu. And don’t miss “The Chop”, a half-pound of freshly-ground beef smothered in brown gravy, grilled peppers and onions. Of course if this isn’t enough food, go for the “Trailbuster” featuring a full pound of meat. Most entrees come with side dishes and/or salads. FYI: the salads are crispy and the baked potatoes are huge and highly recommended! 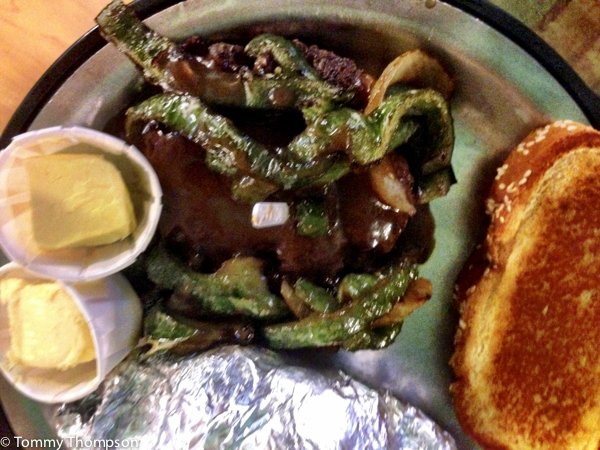 Try “The Chop”–a half pound of ground beef, smothered with gravy, onions and peppers! Finally, and if there’s room, treat yourself to an ice-cream cone or sundae at the Candy Store, adjacent to the dining room, as you leave. You won’t be sorry!